Frank Eliason is Senior Vice President of Social Media at Citibank, and author of @YourService. Frank became renowned for his pioneering work at Comcast in bringing customer service to the social web under the @ComcastCares Twitter handle. This work has been recognized by many news organizations, including ABC News, New York Times, and Business Week. 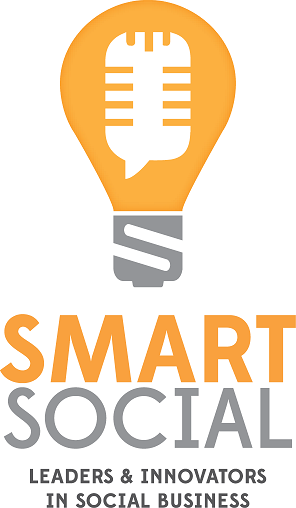 Frank recently joined Social: IRL Principal Ben Smith, and Expion VP of Strategy, Zena Weist, for Smart Social, an ongoing series of conversations with leaders and innovators in social business. Parts one and two of the conversation were shared in an earlier post, with valuable insights from Frank on the @ComcastCares backstory and birth of social customer service. Parts three and four of the conversation are embedded below. Audio podcasts are also available via SoundCloud and iTunes. In part three of this interview via Google Hangout, Frank expands on his recent post Are We, Social Media Professionals, Destroying Social Media. In particular, Frank discusses real-time marketing trends and the need for brands to be part of the social media community in ways that deliver value and not detract from user experience. . In concluding the interview, Frank answers the question “what does smart social mean to me” with some valuable advice for brands: If you want to win in social, concentrate less on social itself, and more on creating remarkable customer experiences. Parts one and two of the conversation with Frank are embedded below. The remainder of the conversation will be shared in a later post. Audio podcasts are also available via SoundCloud and iTunes.. In part one of this interview via Google Hangout, Frank shares the backstory of how @ComcastCares came about and social customer service was born. I’ve spent time recently looking at how restaurants use social media. I’ve been particularly interested in looking at engagement and relationships. I’ve seen a good number of accounts being used as not much more than a broadcast tool. Quick to tell us about daily specials. Slow to respond to customer questions or concerns. Fortunately I’ve also discovered some great examples of well run accounts. Engaged accounts providing effective customer service and offering creative and rewarding social and location based promotions. I’ll share some of the better examples in a later post. One account I was impressed with was @ChipotleTweets, the official Twitter account of Chipotle Mexican Grill. The account was predominantly being used for customer engagement. Much more so than for self promotion. It appeared the primary concern was to connect with customers and build relationships rather than a direct sell. And it was good to see that engagement wasn’t just in response to specific “at mentions”, but appeared to go well beyond that – effective monitoring partnered with prompt, sincere and pro-active outreach. I was able to connect with Colin Burns, member of the New Media Marketing team at Chipotle and one of the voices behind the account. Colin was kind enough to answer some questions about how Chipotle, as a national restaurant chain, sees opportunities with the social web, and specifically their use of Twitter to connect with customers. The Q & A with Colin is set out below. 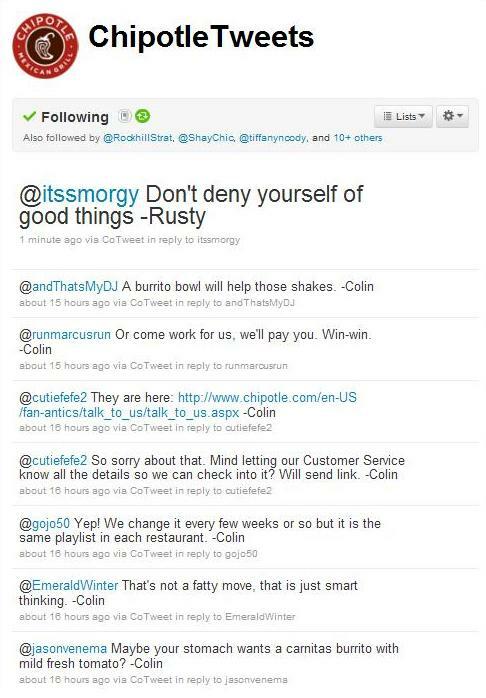 What are Chipotle’s goals in being present on the social web? Here is our written objective: Using the social web, we build and maintain relationships with our fans, customers and opinion leaders through open and honest communication. Our activity on the social web is focused around three pillars: listening, engaging, and educating our fans on Food With Integrity. What are the primary opportunities in using Twitter to engage customers? First and foremost, we see Twitter as a way to engage our customers before they can engage us. We take advantage of the open platform nature of the service and seek them out, talk to them be it good or bad, and let them know that we are listening and care. Secondly, like every other social media service, it is social first and foremost. You can talk to the customer on their terms in a very personal way. The glass door is broken down. What type of results have you seen? Any specific examples that stand out? Just through staying active in search we’ve been able to guide folks to our traditional customer service channel that normally would have never made it there. One was a simple issue – our portions were too small – but he was complaining about it to his friends via Twitter. We saw him in search, tossed him a note, he wrote us through our website and we fixed the issue. We see a few small, simple instances like that a day. Another one that stands out is a girl who tweeted three back to back tweets complaining about her order and how badly we messed it up. She ordered online and by the looks of it, I think we just gave her the wrong order, it was that messed up. She got back to the office and started blasting us. I was sitting on Twitter and saw it come in and immediately sent her a note. I guided her to our website and had her fill out a Customer Service request – we track these things for operational purposes – and we replied back to her via email with a new, free meal within thirty minutes of her Tweet. Her very next Tweet was how amazing we were. And to kick off our Twitter we simply soft launched it. We didn’t put it on our website, we didn’t mention it on Facebook, we just turned the account on. In 15 days we organically grew to 2500 followers by simply talking to people. Sure, we have the power of the Chipotle brand, but how else are people going to find you if you don’t reach out and talk to them first? We just looked for people talking about us and said hello and they followed and engage with us. Overall, what are the primary opportunities Chipotle sees in the social web? From a Customer Service stand point, we see social media as just another way for our customers to get in touch with us. Most people are afraid to talk to a manager and will write into a website. However, a lot of people forget to do that or don’t know they can and so they resort to social media. So we see social media as a way for customers to keep in touch with us be it good or bad. (70% of our Customer Service emails are positive or neutral.) That’s why you’ll see our feed as 95% at replys. Social Media isn’t advertising, it isn’t a way to push your message and get people to buy your stuff. Social Media inherently is a way to talk to people and connect with friends and families. I personally believe companies came along and screwed it up so if we as a brand can get back to the core of what social media inherently is, a human connection, in the end we’ll do well in the space. From a Public Relations stand point, Social Media is an education tool. Every single conversation is an opportunity to educate someone on the Chipotle brand. If they ask why we are so expensive, we can tell them about our naturally raised meats, organic and local produce, rBGH free dairy, etc. If they ask if we have considered queso, we can explain to them the idea of improving the existing menu opposed to adding other things on that we haven’t been practicing for 17 years. (That and queso is loaded with chemicals and takes a degree in Biology to understand.) Things like that. And sure, we do proactively post content, but before I post something I always ask myself, “would I care if I was just a regular customer?” If it doesn’t pass that test, it doesn’t go out.